Sharing with love and hugs! 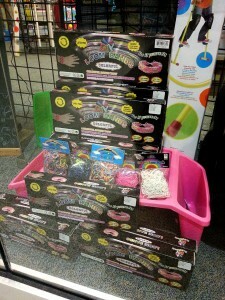 In the same mall, I found another store selling rubber bands and the kit too, this one found at Toys Tyme, it’s call COLORFUL LOOM BANDS, sellinh $14.99, and those bands are $4.99 each pack with 600 bands and 24 clips. This is an off brand, with that price I would perfered to buy the official Rainbow Loom bracelet making kit. Those rubber bands also $1 more than offical brand.